The newest addition to the Tulsa Arts District moves in Tuesday. 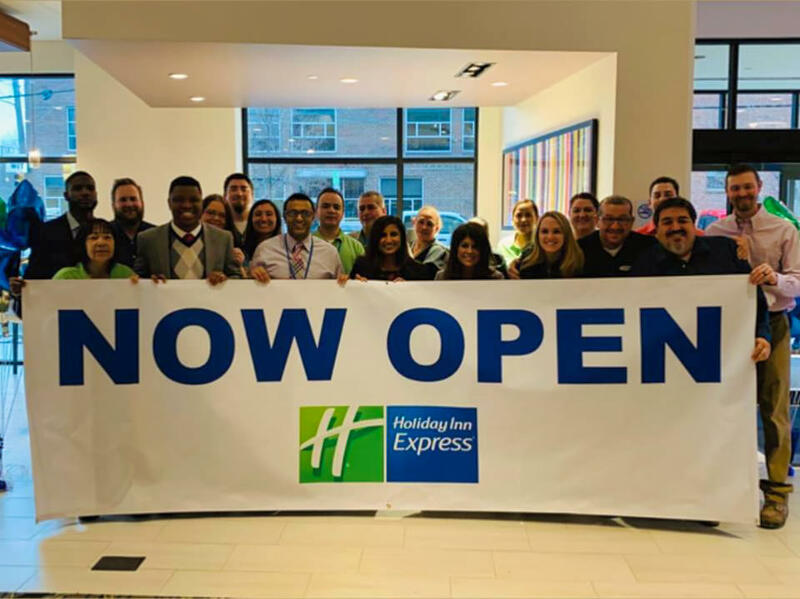 The $16 million Holiday Inn Express & Suites, a collaboration of Promise Hotels and Ross Group, is scheduled to open at 3 p.m. on Archer Street between Detroit and Elgin avenues, Promise Hotels CEO Pete Patel said. The hotel sits just west of ONEOK Field and across the street from a $33 million office building under construction, whose anchor tenant will be Valley National Bank (newly branded Vast Bank). Just to the northwest is the redeveloped Archer Building and just south of the hotel will be a mixed-used, nearly 400-space parking garage set to open in the fall. Of the five-story hotel’s 115 guest rooms, 18 will be suites. A division of InterContinental Hotels Group, the Holiday Inn Express is a select service hotel, which doesn’t offer amenities such as retail food and beverage outlets. This is the third downtown project Promise Hotels and Ross Group have teamed up on. In 2017, they paired up for the nine-story Hampton Inn & Suites at Third Street and Cheyenne Avenue, a block from the BOK Center. They also are partnering on the conversion of the long-vacant and historic Tulsa Club building into a boutique hotel that is set to open in March and will be managed by Promise Hotels under Hilton’s Curio brand. The Holiday Inn Express has an indoor heated pool, fitness center and business center. Part of the Formula Blue prototype, it also features a hot breakfast with items such as scrambled eggs, biscuits and gravy, sausage and Cinnabon cinnamon rolls. All guest rooms will have a Keurig coffee maker. Affiliated with IHG’s environmentally conscious Green Engage program, the hotel also has bulk (refillable) shower items such as body wash and shampoo to mitigate small-container waste. “Even if you’re a local, this hotel kind of caters to a stay-cation, too,” said Kimberly Hosea, Promise Hotels vice president of sales and marketing. “We have a pool for the kids. We have a ton of area stuff to do — Friday night fireworks (from ONEOK Field).